All our items are handmade to order, with care and attention, they are robust and made to last. incl VAT (Photo above left - made in one piece). 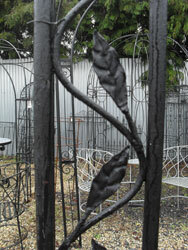 Finished in semi black (metal) paint - not with leaves/vines. £2230 (In three bolt together sections). 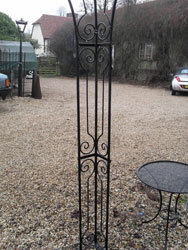 Finished in semi-black (metal) paint - not with leaves/vines. £1670 (For same overall design as photo on left, but with hand forged scroll infilling the legs). Finished in semi-black (metal) paint. 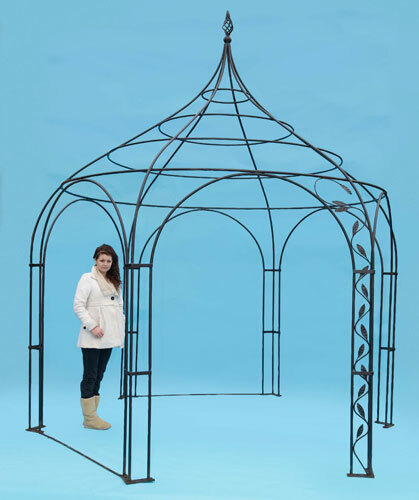 £1865 (Made in three bolt together sections), finished in semi-black (metal) paint.